A few years ago, my school was contemplating giving up cursive in exchange for keyboarding. I'm all about those 21st century skills (actually, I'm a huge proponent of it...I wrote my masters thesis on technology integration!). There is no denying that we live in a technology driven world where digital literacy, keyboarding, and coding are imperative skills for students to learn. Unfortunately, these are replacing handwriting in many schools. 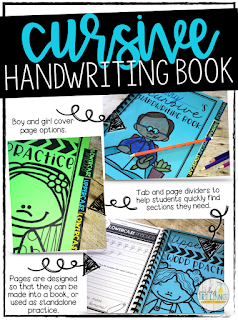 Many policy makers, administrators, teachers, and parents believe that handwriting is a think of the past, an art form rather than a necessary skill to aid in the education of a child. but ya'll, there is actually a plethora of research behind the importance of kids learning cursive! Cursive is absolutely still relevant! 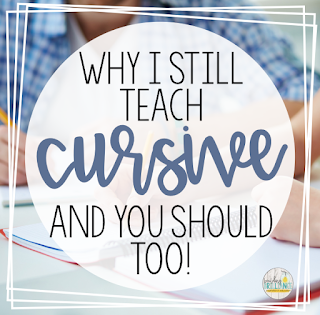 So here are 5 reason that I still teach cursive, and you should too! 1. Quality handwriting increases brain function. Brain research shows that kids with good handwriting activate brain regions associated with cognition, language, and executive functions more than kids with poor handwriting. Quality handwriting comes with practice. Cursive is especially important, because it is a quicker form of writing than print. As kids develop fluency with their writing, they are able to put their thoughts onto paper quicker and more efficiently. (And before you argue that you can type faster than you type...read the next point). 2. Information is processed and retained better when written. There has been an abundance of research that studies the rate of retention for information written versus typed. While students are able to type information quickly, it is an automatic, thoughtless process. As students write, they have to form their own thoughts, by summarizing, paraphrasing, and organizing information. When it comes to retaining information that has been typed or written, students who wrote information perform higher than students who typed information. 3. Cursive is an art form. This is often said as though it's a bad thing. As if art has no place in academia. Art is essential for brain development. It allows kids (and adults alike) to be creative, to express themselves, to be unique, and to take ownership of something personal. Art can also have a calming effect on our brains and help relieve stress. As kids practice cursive writing, they must focus on the fluid motions of the letters, the connections, etc, and this activates different parts of their brain. 4. Cursive helps develop fine motor skills. This goes along with the previous point. Handwriting, and cursive specifically, requires us to use and develop different hand muscles than keyboarding would. Additionally, as these muscles are used, they send signals to the brain, similar to whey you learn to play an instrument. The signals sent between your hand and your brain when writing are stronger and more developed than with typing. Research has shown that students with good handwriting also have more confidence and perform higher on evaluations. 5. So kids can read artifacts of the past Ok. this might be a completely selfish point here, but I want for kids to be able to interpret historical documents. I want them to be able to read cards from their grandma. I want students to be able to sign documents. 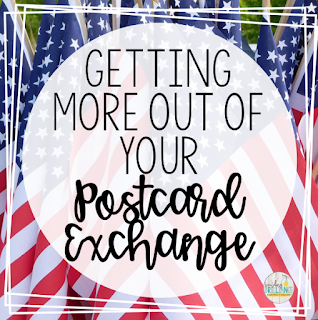 I want for students to be able to connect to the past! In our never-ending quest to move forward, we shouldn't completely forget about the past! Honestly, I love teaching cursive. 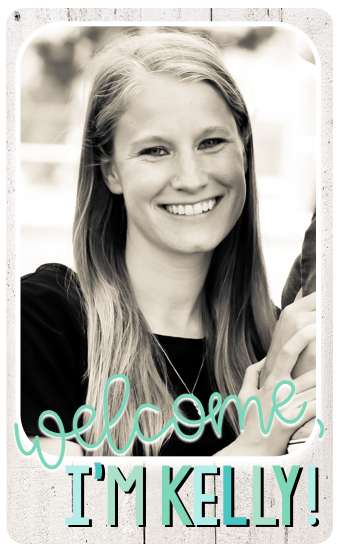 When I was a kindergarten teacher, my students were constantly begging to learn cursive, so when I moved to third grade, it was a dream! Except, the only cursive curriculum I could find looked like it belonged in 1983! 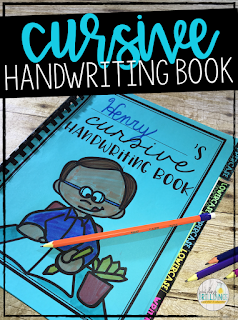 Do you think cursive is a thing of the past or do you think that it still has a place in schools? Let me know in the comments!